Editor’s Note: This story is courtesy of the Patriot League and UTC athletics. CHATTANOOGA, TN. — A turf tackle followed by an interception turned the tide in the first period as Chattanooga roared to a 50-20 victory over Fordham in in the first round of the NCAA Division I Football Subdivision Championship playoffs Saturday. Trailing 14-0, Fordham (9-3) appeared to have a touchdown that would have cut the lead in half before a Ram receiver tripped on the turf. With 45 seconds remaining in the first quarter, UTC sophomore safety Lucas Webb intercepted a tipped pass for a 71-yard touchdown return to give UTC a 21-0 lead. It was Webb’s third career pick-six and his ninth career interception. The Chattanooga Mocs rolled to a 21-0 first-quarter lead, expanded it to 31-0 at the half and waltzed to the win from there. The Mocs (9-3) were able to gain the early momentum with a 40-yard touchdown run by sophomore running back Richardre Bagley. After forcing the Rams to punt on their opening offensive drive, UTC was able to find the endzone again when senior quarterback Jacob Huesman completed a pass to junior C.J. Board, for a 43-yard score. Chattanooga opened the second quarter with a seven-play, 64-yard drive that was capped off by a Henrique Ribeiro field goal from 23 yards. That increased the lead to 24-0. 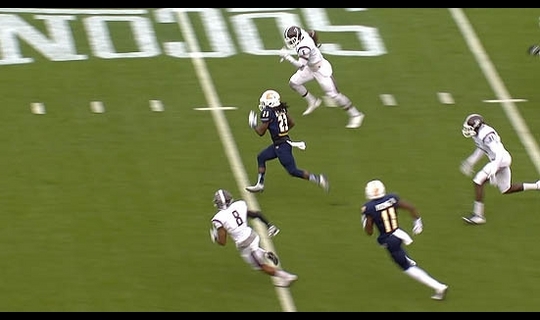 The defense forced another Fordham punt and the Mocs were able to move the ball into the Rams’ red zone. With 10 seconds remaining in the half, Huesman found sophomore James Stovall over the middle from 13 yards out to complete a 13-play, 90-yard drive that lasted just over four minutes. To open the third quarter, Chattanooga continued their first-half dominance on the ground. Junior Derrick Craine, whose 14-yard touchdown at the 12:56 mark ended a six-play, 65-yard drive gave UTC more breathing room with a 38-0 lead. Fordham answered with a quick touchdown pass from quarterback Kevin Anderson, who found Phazahn Odom from six yards out for their first score of the game. After another Ribeiro field goal, the Rams were able to fire off another quick passing touchdown, as Anderson completed a 54-yard pass to Ben Johnson. That would be the last score of the third quarter, as the Mocs still had a 41-14 lead entering the fourth. With big plays for UTC coming from the offensive and defensive side of the ball, the special teams unit started off the fourth quarter with an impact. Deep in their own endzone, Fordham was forced to punt after an unsuccessful offensive drive. When the ball was snapped, sophomore linebacker Dale Warren blocked the punt out of the end zone for a safety. That gave UTC a 43-14 lead with 13:24 to go. With 6:54 remaining in the game, the Rams were able to cut Chattanooga’s lead to 43-20, with a 2-yard touchdown pass from Anderson to Tony Patrignelli on fourth-and-goal. That score was followed by an unsuccessful two-point conversion attempt. The final big play to seal the win came from Stovall, who caught his second touchdown pass from Huesman for a 38-yard score. Huesman finished the game 17-for-25 passing for 211 yards and three touchdowns, with his longest being 43 yards. The senior quarterback also totaled 129 yards on the ground off 15 carries. Out of UTC’s 560 total yards on offense, 360 were rushing. Craine finished with a game-high 154 rushing yards and a touchdown on 23 carries. It was his sixth 100-yard game of the year. UTC was also perfect in the red-zone (4-for-4) and on fourth-down conversions (2-for-2). Defensively, Trevor Wright and Montrell Pardue paced the team with five tackles each. The Mocs defense recorded five sacks, forced Fordham to commit two turnovers and held the Rams to just 89 yards rushing. Fordham’s Kevin Anderson finished 26-40 for 329 yards, three touchdowns and was sacked five times. Jarred Brevard led the Rams in rushing with 10 carries for 70 yards. The Rams made the postseason for the third consecutive year by earning an at-large berth. The Rams fell behind 38-0 in the third quarter before scoring three touchdowns to inch closer. Kevin Anderson threw each of the scores, with a six-yard pass to Phazahn Odom and a 54-yard strike to Ben Johnson to get the Rams within 41-14 with 5:49 left in the third quarter and a two-yard pass to Tony Patrignelli to cut Chattanooga’s lead to 43-20 with 6:54 to play. The Mocs would tack on an insurance touchdown for the 50-20 final. Anderson completed 26-of-40 passes for 329 yards and the three scores, while Jarred Brevard rushed for 70 yards. Johnson caught three passes for 91 yards and the score, while Odom had six catches for 85 yards and the touchdown. Three Rams had double-figure tackles, led by JQ Bowers with 15. Fordham had won first-round playoff games in the past two seasons, beating Sacred Heart at home each time. The Rams were one of only seven FCS teams in the postseason for the third year in a row, and the first Patriot League squad to make it in three straight years since Lafayette went from 2004-06. The Mocs shift their focus to a Dec. 5 road matchup in the second round against No. 1 Jacksonville State. The Gamecocks are coming off a first-round bye. Next week’s matchup kicks off at 2 p.m. (E.S.T. ).